There's always a place for fresh and frozen favorites inside the Whirlpool 30 in. wide Top Freezer Refrigerator with 19 cu. ft. capacity. Finding food is easy thanks to energy-efficient LED interior lighting, and for more convenient storage options, the Flexi-Slide bin quickly moves side to side under the refrigerator glass shelves. There's even an additional door bin with electronic temperature controls inside the refrigerator to help you store more, so there will always be room for what you want, where you want it. 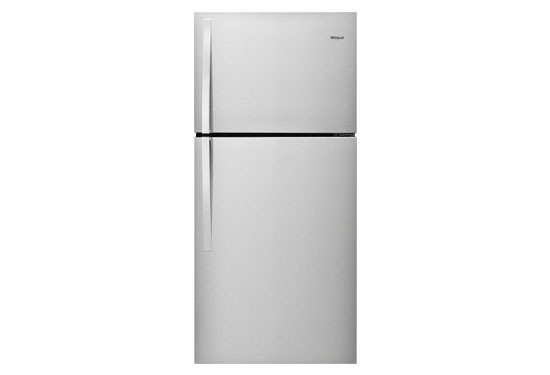 Rent to own Refrigerators made by Whirlpool with no credit check and same day delivery at ColorTyme. ColorTyme offers the best rent to own prices and easy payment plans on the Whirlpool 19.3 Cu. Ft. Top Freezer Refrigerator.